The current communication scheduling algorithm for smart home cannot realize low latency in scheduling effect with unreasonable control of communication throughput and large energy consumption. In this paper, a communication scheduling algorithm for smart home in Internet of Things under cloud computing based on particle swarm is proposed. According to the fact that the transmission bandwidth of any data flow is limited by the bandwidth of network card of sending end and receiving end, the bandwidth limits of network card of smart home communication server are used to predict the maximum practicable bandwidth of data flow. Firstly, the initial value of communication scheduling objective function of smart home and particle swarm is set, and the objective function is taken as the fitness function of particle. Then the current optimal solution of objective function is calculated through predicted value and objective function, current position and flight speed of particle should be updated until the iteration conditions are met. Finally, the optimal solution is output, the communication scheduling of smart home is thus realized. Experiments show that this algorithm can realize low latency with small energy consumption, and the throughput is relatively reasonable. J. Zhang and M. Wang, “Research on Communication Scheduling Algorithm for Smart Home in Internet of Things Under Cloud Computing,” J. Adv. Comput. Intell. Intell. Inform., Vol.23, No.1, pp. 124-128, 2019. W. J. Gu, “Study of the Shared Resource Data Scheduling Method of the Internet of Things,” Computer Simulation, Vol.34, No.1, pp. 268-271, 2017. J. Guo, S. Durrani, X. Zhou, and H. Yanikomeroglu, “Massive Machine Type Communication with Data Aggregation and Resource Scheduling,” IEEE Trans. on Communications, Vol.65, Issue 9, pp. 4012-4026, 2017. M. H. Min, Z. J. Yang, Z. S. Li, and Z. F. Liu, “Research on Multi-slot Frame Scheduling Algorithm in Industrial IoT Applications,” Computer Engineering, Vol.42, No.11, pp. 15-21, 2016. W. J. Wang, Y. Yu, X. H. Sun et al., “Modeling of Household Energy Consumption Scheduling and Its Solving with Ant Colony Algorithm,” Computer Technology and Development, Vol.27, No.2, pp. 195-199, 2017. H. B. Zhang and Y. H. Kuang, “Simulation Research on Load Balancing Optimization Scheduling of Communication Resources in Internet of Things,” Computer Simulation, Vol.34, No.6, pp. 310-313, 2017. 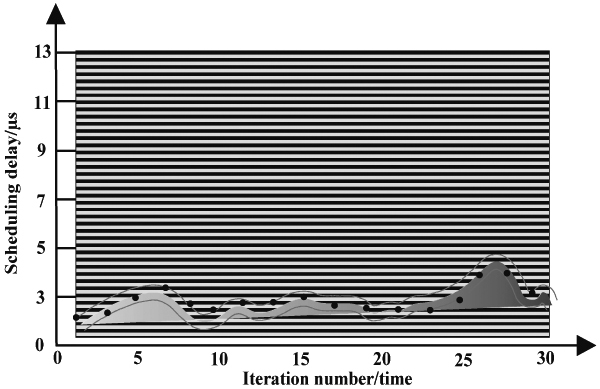 C. Lin, D. Han, J. Deng et al., “P2S: A Primary and Passer-by Scheduling Algorithm for On-demand Charging Architecture in Wireless Rechargeable Sensor Networks,” IEEE Trans. on Vehicular Technology, Vol.66, Issue 9, pp. 8047-8058, 2017. W. Shi, C. Jie, Z. Quan, et al., “Edge Computing: Vision and Challenges,” IEEE Internet of Things J., Vol.3, No.5, pp. 637-646, 2016. M. Khan, S. Din, S. Jabbar, et al., “Context-aware low power intelligent SmartHome based on the Internet of things,” Computers & Electrical Engineering, Vo.52(C), pp. 208-222, 2016. K. Kaur, S. Garg, G. S. Aujla, et al., “Edge Computing in the Industrial Internet of Things Environment: Software-Defined-Networks-Based Edge-Cloud Interplay,” IEEE Communications Magazine, Vol.56, No.2, pp. 44-51, 2018. Y. Sahni, J. Cao, S. Zhang, et al., “Edge Mesh: A New Paradigm to Enable Distributed Intelligence in Internet of Things,” IEEE Access, Vol.5, No.99, pp. 16441-16458, 2017. Y. Nikoloudakis, S. Panagiotakis, E. Markakis, et al., “A Fog-Based Emergency System for Smart Enhanced Living Environments,” IEEE Cloud Computing, Vol.3, No.6, pp. 54-62, 2016. R. N. Chang, X. Cheng, C. Wei, et al., “Guest Editorial Special Issue on Fog Computing in the Internet of Things,” IEEE Internet of Things J., Vol.4, No.5, pp. 1113-1116, 2017. M. Dabbagh, B. Hamdaoui, M. Guizani, et al., “Exploiting Task Elasticity and Price Heterogeneity for Maximizing Cloud Computing Profits,” IEEE Trans. on Emerging Topics in Computing, Vol.6, No.1, pp. 85-96, 2018.